Greetings, friends and neighbors! With the 2018 Legislative Session in our rear-view mirror, I want to share some of the legislative achievements for Idaho this year. I am also pleased to share some successes for the committees I sit on: Senate Education, State Affairs, and Transportation. $500,000 increase for information technology (IT) staffing, bringing the amount to be distributed to school districts to $8 million. There are additional increases and decreases for several other distributions that net to the $100 million General Fund increase over the current year. That Idaho can make these increases to the education budget is a testament to the discipline applied to balancing the budget during the Great Recession. 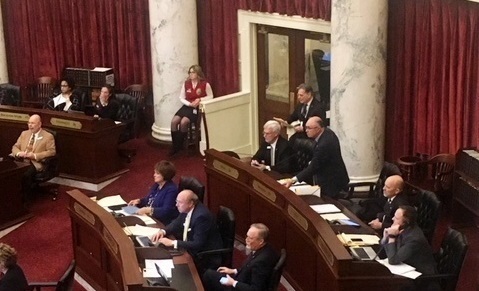 I am pleased that education continues to be the focus of Idaho’s budget. Community colleges saw an increase of ?, and Idaho’s state colleges and universities received $576.8 million, a 3%, $8.7 million increase. I am proud to say we cut taxes with the largest tax cut in Idaho’s history. In addition, legislators came together to pass a much-improved property rights bill only days before adjournment. Below, I discuss these, and other major pieces of legislation passed during the 2018 Legislative Session. H 463 – Cuts Idaho taxes by $200 million and conforms Idaho taxes (definition of taxable income) to federal tax cuts passed in December 2017; lowers marginal rates for all tax brackets by .475 percentage points. H 465 – Restores preventive, non-emergency adult dental coverage to Medicaid patients as provided before it was cut in 2011. H 471 – Vehicles travelling in the left lane of traffic cannot impede other vehicles traveling at the legally posted speed limit. H 547aaS (as amended in the Senate)(2x) – Creates consistency among building codes across jurisdictions in Idaho by limiting the authority of local jurisdictions to adopt residential building codes different from those reviewed, amended, and adopted by the State. H 606 – Open Meeting Law Expansion – subjects boards and commissions created by Executive Order to Idaho Open Meeting Laws, with the exception of the Cybersecurity Task Force and the Governor’s committee awarding the Idaho Medal of Achievement. H 643 – Funding for Idaho’s magistrate courts – Resolves funding disputes between several Idaho cities and counties for funding of magistrate courts, phasing out local funding over five years for state funding. H 658aaS (as amended in the Senate) – Property Rights Bill – strengthens trespass laws for private landowners; makes language in code consistent, and creates one place for all trespass laws including administrative, criminal, and civil trespass laws. H 658aaS expands education on rights and responsibilities for both property owners and citizens. The final version of this bill considers sportsmen’s concerns and created a balance between the land owner and an unaware trespasser. H 665 – School Threats Bill – Expands Idaho’s school-threats law to include threats of violence at schools or school activities, including those made from off-site by phone or social media. Threats are a misdemeanor offense, and knowingly possessing a firearm to follow through with a threat a felony offense. S 1279 – Opportunity Scholarship Bill – Allows up to 20% of the State Scholarship Fund to be increased for Fiscal Year 2019 from $10 million to $13.5 million for “adult completers” to return to school to complete their education. S 1313 – Stand Your Ground, Castle Doctrine – Supports the theory that you may protect your home and the area around your home with the use of a firearm. These and many and all other bills printed by the legislature this year are available at Idaho's Legislative Web Page, www.Legislature.Idaho.Gov. To find and read bills, click this link: 2018 Bills. Two notable achievements for me this session include the “Legislator of the Year” award from the Idaho Professional Firefighters (IPFF) and an award for the legislative Steps for Schools. IPFF present their “Legislator of the Year” award each year to a legislator who supports the work of IPFF by helping make Idaho a friendly state for firefighters to live and work. Steps for Schools, organized and sponsored by the Blue Cross of Idaho Foundation, gives legislators the opportunity to earn $500 for a school in their area when they walk an average of 10,000 steps per day during the month of February. I am happy to be able to award a check to Ponderosa Elementary for meeting the goal. It has been my pleasure to help Idaho’s firefighters and to give back to my community while promoting a healthy lifestyle with the Steps for Schools program. After serving as the Senate Assistant Majority Leader for the past eight years, I am grateful to have the confidence of my colleagues who elected me to serve as Majority Leader. My first year as Leader was invaluable. I gained experience conducting the Senate floor and schedule, maintaining decorum, and honoring the tradition of excellence kept in the Senate. I look forward to what the Senate will accomplish in 2019. Finally, I want to say thank you to all who called, e-mailed and wrote me letters regarding the issues facing our State. I appreciate hearing from my friends and neighbors in District 20 and from all Idahoans willing to stay informed and involved. Hearing how Idaho’s laws and proposed legislation affects you and your family helps me serve you better. I wish you a safe and enjoyable summer!